Call us at (586) 774-7171 today. The Harper Chiropractic Center Center has been serving the community for over 30 years, providing quality and affordable healthcare without the use of drugs or surgery. Naturally, chiropractors help correct traditional neck and back problems, but chiropractic has also produced fantastic results in people with a variety of problems you wouldn't normally associate with the spine. For more information on this, please visit our Wellness Library and "Live" Patient Video Testimonials. 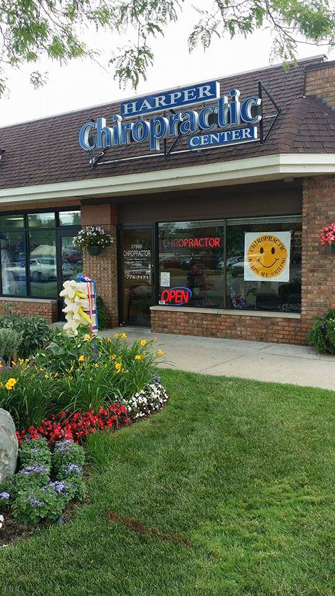 Our office is located on Harper Avenue at 11 mile road, in the heart of St. Clair Shores, Michigan, where you will enjoy the best possible chiropractic care. We are directly across the street from Nino Salv aggio's. Ou r patients count on us being open 6 days a week for both chiropractic care and massage therapy from early morning to late evening. Flexibility is our specialty! Join your friends and neighbors who live more active, healthier lives because of the care they receive at Harper Chiropractic Center. You can enjoy the same sense of well-being, renewed energy and optimized health that folks have been enjoying with the gentle, specific care provided by the doctors at HCC. Chiropractic is safe, natural, and effective! Call today and speak to our friendly knowledgeable staff! "It's amazing how much maintenance helps keep everything in order. I am almost afraid to miss my maintenance appointment."